The inaugural boys and girls basketball season for Providence Hall High School has not been without its bumps and bruises. But the girls and boys coaches both believe the program is beginning to be established and headed in the right direction. “We are certainly growing and learning. The girls’ team only has two upperclassmen, but these are great kids, and they are working hard,” girls head coach Alle Cardwell said. The girls team is 4-7, and the boys are 10-5 overall. “We have some freshmen playing varsity, and we are relatively inexperienced, but we are young and growing. We are learning what it takes to win at this level,” boys head coach Blake Pugmire said. Senior Jasmine Boonyakiti leads the girls’ team in scoring, averaging 9.4 points per game. Freshman Isabel Page is second on the team with 8.7 points per game. “Jasmine has done a great job leading us. She sets up our offense and makes sure the girls are in position. Isabel is young, but she has lots of skill and can get to the rim. I think she has the best shot on the team,” Cardwell said. On Dec. 8, the girls lost to Merit Academy in Springville 40-36, but Cardwell said they had their best game against them Jan. 27, winning 37-25. Page scored 12 points in the win. “The girls really communicated well on defense, and it felt good for us to come back and win against a very good team,” Cardwell said. 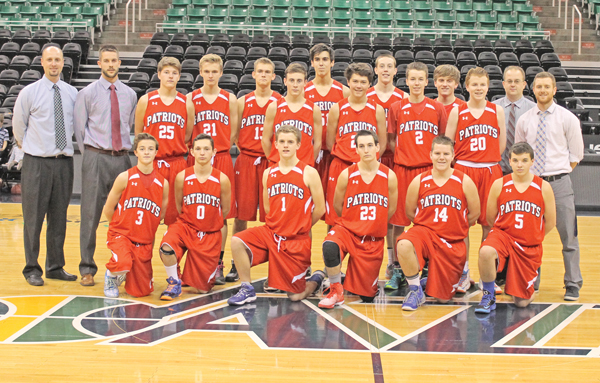 The Patriots boys team was invited to play in the Court of Dreams game at Energy Solutions Arena Dec. 12 against Merit Academy. They won the game 68-37. Junior Dallin Mortensen scored 28 points, Hayden Bush had 14 and Christian Heugley scored 8. Mortensen leads the boys’ team in scoring, averaging 16.5 points per game. Freshman point guard Andrew Heugley has averaged 6.3 assists per game. “Andrew has impressed me with how mature he is for a freshman. He has become a natural leader. Dallin is a fantastic shooter. He has become our most valuable scorer, and we rely on him heavily to get us baskets,” Pugmire said. Pugmire and Cardwell are both first-year head coaches. Cardwell graduated from Riverton High School in 2009. She played college basketball at Snow College and Utah Valley University. Pugmire played at Rich High School and was an assistant at Lone Peak High School for two seasons prior to coming to Providence Hall. Providence Hall High School opened last fall. This is their first year competing under the Utah High School Activities Association. The UHSAA placed the Patriots in Region 14.